One man's journey from the Corporate to the Agrarian for the sake of Faith and Family. When a friend of ours first heard about our agrarian interests, he started passing me all sorts of articles and such about farming. They ranged everywhere from boutique farms selling homemade goat yogurt, to one multi-million dollar farm going up for auction in our area. (That 28 acre farm which I mentioned in an earlier post, Death of a Farm, sold for 2.2 million dollars!) That should give you a good indication of why we feel the need to move out of this area if we are going to establish a multi-generational legacy attached to the land. But one of the earliest things he gave me was a copy of Reader's Digest's Back to Basics. If you haven't seen it, it's a great book. Just about any skill or activity you might be interested in: selecting land, building a shelter, beekeeping, raising livestock, preserving produce, etc. For each activity you get a concise introduction, a general how-to, and usually a list of further reading if you want to pursue the topic more fully — all in a two-page spread. As I read through all the different areas, I would dream about having the land to start different projects. I would not try to do everything at once, but as my sons showed interest we would add activities, one at a time. I had a lot of different ideas about what I would do if I had the land. I remember thinking what a great idea it would be to farm with horses. After all, you don't have to buy gas and oil, and I haven't heard yet that you can breed tractors when you want another one. Anyway, I was getting excited about this idea, of farming with horses, but didn't think anyone did this anymore except the Amish. And I thought that it was too bad no one else saw the value of work horses. Well, I was pleasantly surprised to find a section in this book all about farming with horses! And not only that, there was a sidebar about how a Lynn Miller was able to farm with horses and calculated that it saved him an average of $60 an acre to do so. 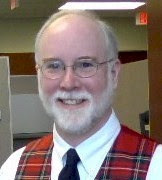 It also mentioned that Lynn Miller published a periodical called "The Small Farmer's Journal." Now I was getting excited! Not only did I find that there were others that also saw the attraction of work horses, they were able to show that not only was it feasible, it was cost effective to boot! 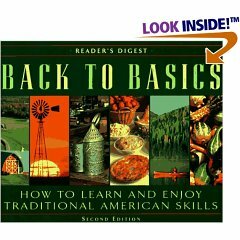 However, I also realized that the copy of Back to Basics I was reading was over twenty years old, and chances were "The Small Farmer's Journal" was no longer in existence. 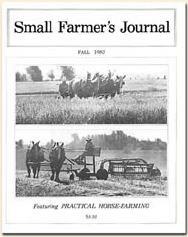 After a quick Internet search, I found that not only was "The Small Farmer's Journal" alive and well, they boasted of having an international readership and even hosted annual "Horse Progress Days" around the country. I was so excited that I wrote a letter to Lynn Miller telling him how I found out about him and his Journal, sharing how excited I was to find other work horse enthusiasts. A couple months passed by with no response, then one day there was a message on my answering machine. It was from a retired NJ state trooper who now lived less than a half hour from me. Turns out he had read my letter which had been published in the journal and had seen the same excitement in my letter as he had felt himself when he took up working with draught horses after his retirement ten years earlier.He invited my son and me to attend a local gathering of about a half dozen different families and their teams. They gathered at one family's farm which had a large riding ring. They fixed up the ring like an obstacle course and let each family put their team through its paces. They had different stations to test the team and the driver's skill. There was one station that simulated driving over a wooden bridge (evidently something some horses can be shy about), one that was a stop sign at an intersection, and one where the driver had to back his team into a parking place. Parallel parking for horses! It was great to see how well these horses would respond to voices of their drivers. The man that invited us offered to teach me how to be a driver, but I had to say no. At least not until I had finished my fireplace project at home. That project had been hanging over my head for a couple years. In fact, I had originally installed the propane powered fireplace back during the build-up to Y2K, and had never finished closing it in, and I didn't think it right to start pursuing something new until I had it completed. That was a couple of years ago, and I'm glad to report that the fireplace is finally finished! Now, I wonder if I still have that man's phone number...? A father who dreams of raising his sons for the glory of God.